Embarrassed by Your Imperfect Smile? We Can Help! When it comes to beauty, never overlook the difference your smile can make. The brighter and straighter your teeth, the more confident you can be in your appearance throughout your daily life. Foothills Family Dental offers the cosmetic procedures you need to achieve full dental health and beauty. We give all Fort Collins residents the opportunity to have their teeth cleaned, straightened and whitened. Teeth whitening provides quick and lasting beauty, giving your mouth a bright and consistent appearance. In fact, having whiter teeth has become the number one aesthetic concern of most our patients. That's why we offer a number of options for teeth whitening. The most popular method is using a home teeth whitening system that will whiten teeth dramatically. Since teeth whitening only works on natural tooth enamel, it is important to evaluate replacement of any old fillings, crowns, etc. Replacement of any restorations will be done after bleaching so they will match the newly bleached teeth. Note: teeth whitening is not permanent. A touch-up may be needed every several years, and more often if you smoke or drink coffee, tea, or wine. Before whitening your teeth, Foothills Family Dental takes into consideration the overall health of your teeth, the restorations currently in place and the shade of white you are looking for. We can then make a recommendation for the best teeth whitening procedure for your teeth. 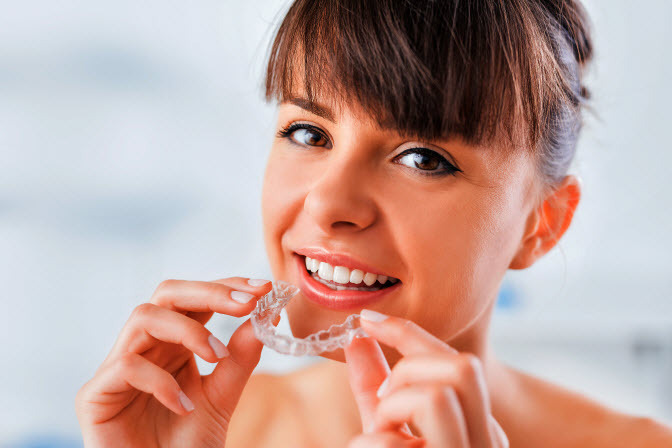 In the past, patients seeking straighter teeth had to rely on braces to reposition their teeth. Not only do traditional braces present an inconvenience for eating the foods you love, greater discomfort and maintenance, many of our patients didn't like the idea of wearing them 24/7. That's why Foothills offers Invisalign®. A series of removable, clear aligners specifically fitted to your teeth. They provide the same straightening capabilities as traditional braces, with all the inconveniences. With Invisalign® treatments, your friends and family won’t notice any change in your appearance— until, of course, they realize that your teeth have gotten straighter and straighter. If any of your teeth have become chipped, broken, or misshapen, you may assume that the effects will stay with your smile for the long haul. In fact, Foothills Family Dental can quickly and easily correct this damage by applying dental veneers. Produced from porcelain, veneers adhere to the front of your teeth producing the appearance of natural teeth while providing a sturdy barrier against stains and damage. The Foothills team can integrate these and other prosthetics into your mouth, carefully blending them with your natural teeth so no-one can tell the difference. To schedule a consultation for a smile makeover or for more information on cosmetic dentistry in Fort Collins, contact Foothills Family Dental today.